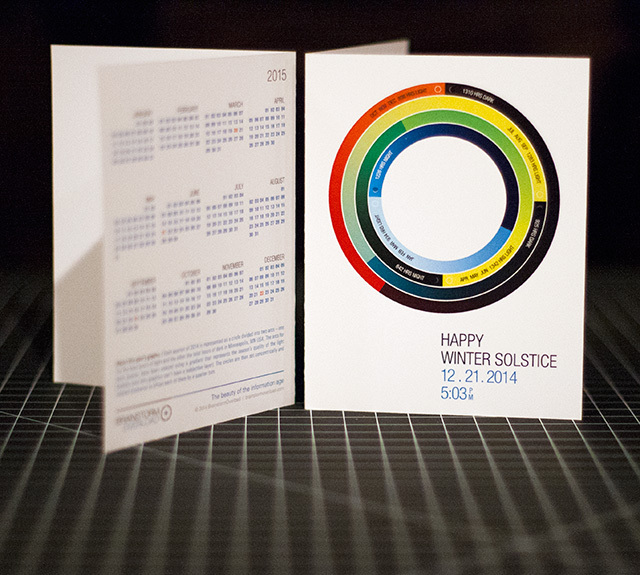 Winter Solstice Card 2014 - BrainstormOverload - Small design studio. Big ideas. We managed to carve out some time to prepare for this year’s winter solstice and are delighted to have put the analog results in the mail to our clients. As is our tradition we’ve posted a print quality pdf for download for any of the roughly 6 billion people we can’t mail one to. For this year’s graphic each quarter of 2014 is represented as a circle divided into two arcs – one for the total hours of light and the other the total hours of dark in Minneapolis, MN USA. The arcs for each month have been colored using a gradient that represents the quality of the light (nobody said info graphics can’t have a subjective layer). The circles are then set concentrically and each one rotated 90º clockwise.